Our first logo was designed originally by the Quilted cooperative. It has mutated since, as these things do. 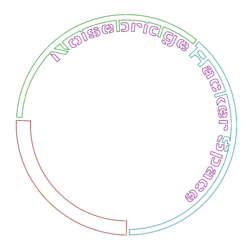 An additional design was by Jonas Frankki of Denmark in 2009. This is the PDF vector file we use for making stickers. Noisebridge enjoys the color red and black. If you Google around you might find some more information about these colors. The original version of our logo had a gradient for the background, and many epic wars were fought but none won to establish a single shade of red. The specific shade was established by mediapathic in December of 2008 when he produced version 2 of our logo. Now in fancy black and white! Reboot 2014 Logo by Jarrod Hicks is licensed under a CC BY-NC-SA 4.0 International License. 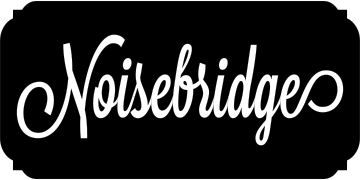 Original Noisebridge logo design by Jonas Frankki 2009. 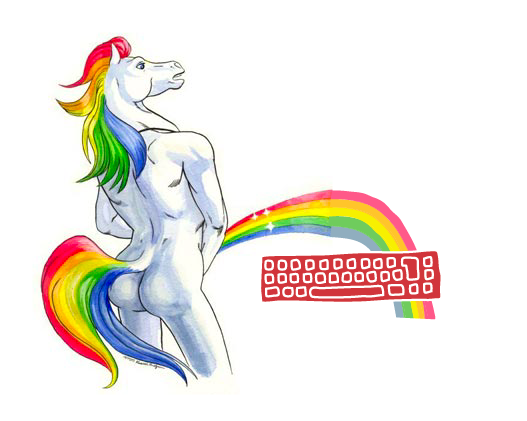 Or "Typing over the rainbow." This logo was designed by Jonas Frankki in Denmark with Jacob Appelbaum. It is available under the Creative Commons. It is licensed under the Creative Commons Attribution-Share Alike license. 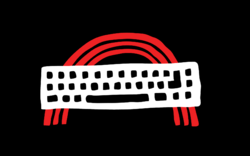 This image is inspired by the CCC Sterntastatur (logo here), the RAF (logo here), the Weather Underground (logo here) and San Francisco (hacker) Values. electronics crowd. This could definitely use some work to include the other ideas though. Logo_hires.png locally cropped version; noisebridge-alpha.png with alpha channel. 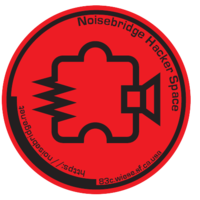 The following gcode renders the Noisebridge logo for CNC. While the color and concept is nice, the circuit is kind of ungrammatical. The little bumps on the top and bottom are used to emphasize that two wires are crossing over one another and not connecting --- but there's no other wire there for them to pass over. 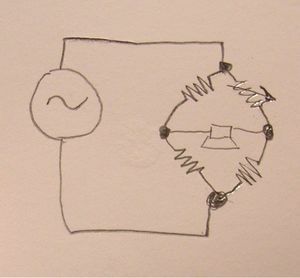 A simple way to fix this would be to add a vertical line through the middle of the logo all the way to the edge of the circle; that would render the circuit grammatically correct, although it still wouldn't be a circuit that did anything useful, except perhaps convert a little sound into heat. A perhaps cleverer idea would be to incorporate a "bridge" circuit into the logo. A bridge is a square with a diagonal, with things connected to the corners of the square not on the diagonal, and it's the simplest circuit that can't be decomposed into series and parallel subcomponents. A bridge rectifier with a speaker on the diagonal would be both a nice illustration of the name, and also might have interesting nonlinear audio effects (as an output stage, not as a noise generator itself) if you actually built it. After some IRC discussion, I'm uploading a photo of a pencil sketch of a Wheatstone bridge with an AC power source and a speaker in place of the galvanometer. 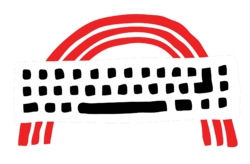 Got to playing with InkScape a bit today, and made a few noisebridge-themed things to consider. The circuit in the first is an audio signal going through a bridge rectifier to a speaker, which I haven't built (yet), but which would have the effect of kicking the fundamental frequency up an octave and distorting everything. 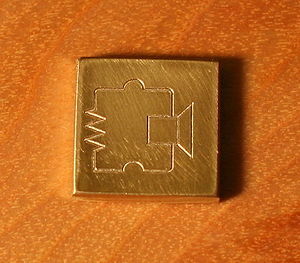 The wheatstone circuit above would fit this layout too. This one had the interesting unintended side effect of being shaped like a cartoon rocket. 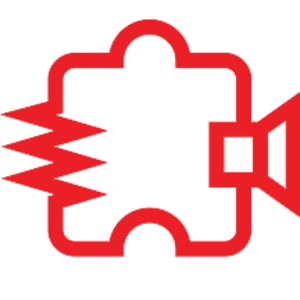 The other two are just pseudo-oscilloscope buttons showing noise, keeping to the shape and color scheme of the current logo with a simpler theme. I uploaded these as pngs for easy web viewing, but if anyone wants the svgs to play around with let me know. More information and resources can be found on the Pamphlet page. This page was last edited on 24 February 2019, at 21:54.